This is a fantastic reflective exercise for me! I had even more fun picking my favorites this year than last. I hope you find new people on this list who will inspire you, as they have inspired me. 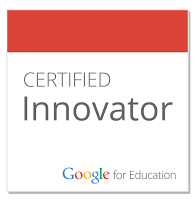 Best individual blog - One of the EdCamp Movement's founders, Kristen Swanson, is in my exclusive Google+ MVP circle. Her Teachers as Technology Trailblazers blog is a must-read. Best group blog - I agree with Larry Ferlazzo's nomination of MiddleWeb. I don't subscribe to very many email newsletters, and I really look forward to receiving SmartBrief, MiddleWeb's thrice-weekly email. Best new blog - The Learning Pond. A new interesting voice to learn from: Grant Lichtman, who started this blog in March of 2012. Thanks to +Sean Wilson for the lead. I'm not sure if I can nominate two. If so, I would also include Jennifer Magiera's Teaching Toward Tomorrow, which is equally as good. Best class blog - Mrs. Yollis' Classroom Blog (again). Her students are so lucky to have her. 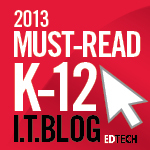 Best ed tech / resource sharing blog - Cool Tools for 21st Century Learners. +Susan Oxnevad offers an array of visual resources, with an emphasis on Google tools. Her Google Docs for Learning Glog is pretty awesome. Best library / librarian blog - Neverending Search. Consistently forward-looking and solidly grounded in best practices, Joyce Valenza fires me up to try new things. Best administrator blog - Dr. Doug Green blogs every day. Here's his twitter description: "Bite-Sized Self-Development Resources for Educators and Parents/Book Summaries/Net Nuggets." Best individual tweeter - I joined Twitter in 2010 just to follow @joycevalenza. Her tweets are jam-packed with resources and idea for all educators. She's still my #1 MVP. Best free web tool - Google+ Hangouts. Transformative for me. You can get a good idea about how hangouts are beginning to change education at eduhangout.org. Best educational use of audio / video / visual / podcast - EdReach hands-down. Over two dozen channels covering a variety of topics. And they have the neatest hangouts. 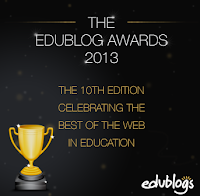 Update 11/28/13: +Sue Waters of Edublogs created a Flipboard magazine that will contain all of the nomination blog posts. http://flip.it/ozYJS. Great idea!